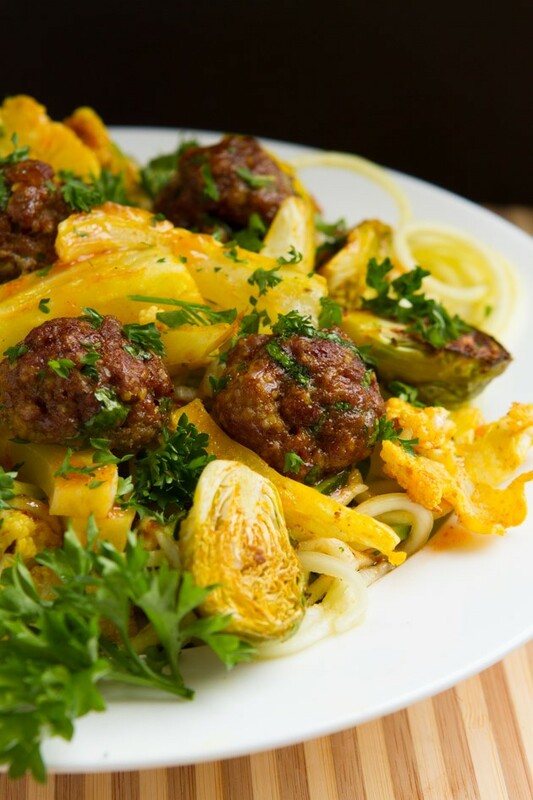 Grain-free mini meatballs tossed with roasted seasonal vegetables in a tangy sriracha sauce. Dropped over freshly spiralized zucchini noodles. Preheat oven to 375F. Chop veggies and place on a baking sheet. Coat with palm oil and cumin. Toss. Transfer to preheated oven and roast for 20 minutes. Meanwhile, combine meatball ingredients in a large bowl. Press with your hands to combine. Pinch about 1 tablespoon or smaller of the mixture into your hands. Roll, and place on a parchment paper or silicon-lined baking sheet. Repeat with remaining mixture. Should make about 22 mini meatballs. Once vegetables are complete, reset oven temperature to 320F. Slide in the sheet of meatballs and cook for 15 minutes. Meanwhile, prepare the dressing in a small bowl. Whisk until combined, set aside. Spiralize zucchini. 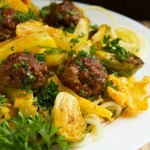 Add all ingredients to a large bowl: spiralized zucchini, roasted vegetables, dressing and meatballs. Toss to coat and serve with additional cilantro, if interested. Vegetables: Use any vegetables you’d like here. Celery would be nice. Egg: If you’re allergic to egg, don’t add it. The meatballs are great without it. Sriracha: If you don’t like Sriracha, you could use red curry paste, too. Or harissa would be good!